The 5 Pc. Rattan Patio Set has a modern look, yet is comfortable and durable. 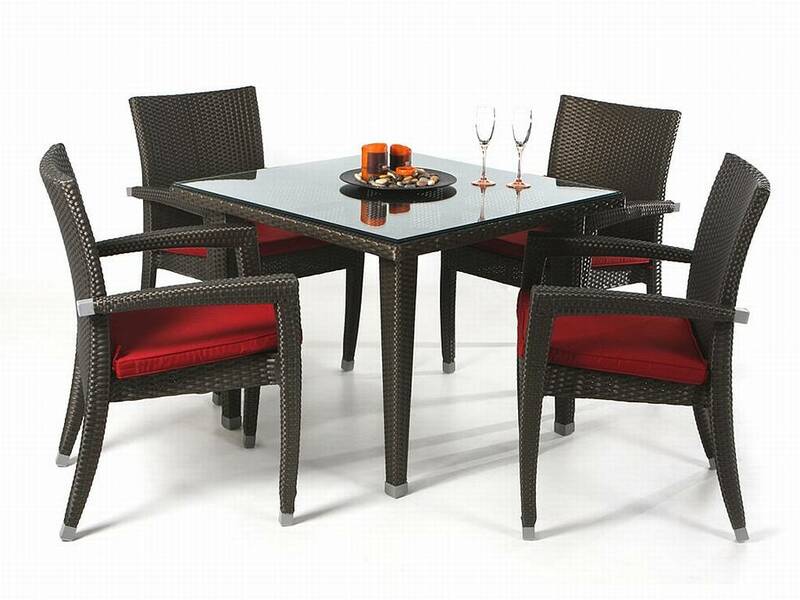 The chestnut brown set is made of PVC woven rattan over a solid aluminum, rust-resistant frame. It features a 1/2" thick beveled edge glass table top for year-round maintenance-free outdoor living. The four stackable chairs have comfortable armrests and are finished with decorative aluminum ferrules. The chairs also feature vinyl straps with memory retention, which gently "give" while you are seated in them. 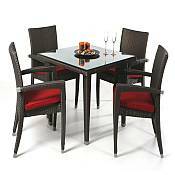 This patio furniture collection is perfect for family dinners or for entertaining friends on a relaxing evening. Dining outdoors has never been finer! The 5 Pc. Rattan Patio Set will provide years of enjoyment, luxury, style, and comfort.